The Tablet P and Tablet S marked Sony’s first attempt at the tablet segment and though both were pretty solid and thoroughly innovative, none made a big enough impact on the market. That might change though with the second generation of tablet devices Sony is readying supposedly for a launch during the holidays. Also, in another interesting development, Sony has moved its entire tablet operations into the Xperia brand that until now comprised of only its smartphone range. Now coming to the upcoming Xperia Tablet (that is what it is referred to until it gets its official name) specs, things are definitely a notch higher than Sony’s first gen devices. Powered by the latest NVIDIA Tegra 3 quad core processor, the device will come with 1 GB of RAM and will be available in three memory size variants of 16, 32, and 64 GB. The tablet would sport two cameras, with the one at the rear being a 8 megapixel lens and a 1 megapixel unit making up the front. Further, the Xperia Tablet will continue with a 9.4 inch display and a resolution of 1280 x 800 pixels. A battery of 6,000 mAh rating will be providing the juice, which Sony has stated will be good enough to support around 10 hours of operation. Also, the Xperia Tablet will run Android 4.0 ICS, though we hope Sony changes its mind and offers Jelly Bean right out of the box. 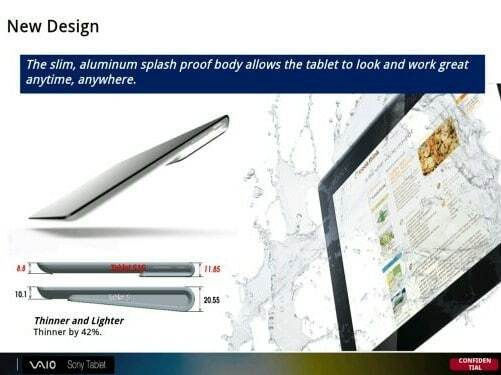 Another interesting fact about the upcoming tablet is that while Sony isn’t giving up on the wedge shape of Tablet S that had made it unique, the entire thing has been shaved down considerably to make it what Sony is claiming to be 42 percent slimmer. It’s not going to be more than 12 mm at its thickest point, though the tablet will continue to resemble a folded magazine, which in turn makes it quite convenient to hold and operate. The price of the tablet is expected to be $449 for the 16 GB model when it hits the market, with the subsequent 32 and 64 GB variants likely to cost $549 and $649 respectively. There is, however, no confirmation on the exact date of the tablets‘ arrival at the market, though the holidays are the expected time frame. Further, with the tablet coming from Sony, it’s expected that the device will be PlayStation certified. What this means is that users will be able to download and play PlayStation games on the tablet itself. Expect more of the device in the coming months.